What do you think of when you think of Berlin? Maybe you think of the tourist destinations such as the Brandenburg Gate or Checkpoint Charlie. Maybe (if you’re my age, almost certainly) you know it as a focal point for European, Australian and American twenty-somethings seeking relatively cheap rent and attractively-priced beer. As a PhD student lucky enough to carry out some of my research here over the past few months I’ve seen many sides to the city, and its history has fascinated me. But there’s a problem: for a researcher of the nineteenth century, there can be such thing as too much history. The events of the twentieth century have left such a mark on Berlin that the decades of the early to mid-nineteenth century (and earlier) are often forgotten. How can the nineteenth century compete with the twentieth-century legacy of empire, war and one republic, not to mention a division of Germany that only ended twenty-five years ago? It was with interest, then, that I read the latest edition of Der Spiegel’s history magazine focusing on the March revolution of 1848 in Germany. Michael Sontheimer’s essay on the revolution in Berlin, “Berliner auf den Barrikaden” (Berliners on the Barricades) opens with a similar observation on the overwhelming presence of twentieth-century history in the capital: Checkpoint Charlie attracts 85 times more visitors per year than the exhibition on the March revolution in Volkspark Friedrichshain. His essay evokes the presence of the revolution on the Berlin streets, illustrated with glossy colour reproductions of paintings showing clashes between soldiers and revolutionaries at well-known locations: yet very few people in Berlin probably know that these events unfolded at the very spot where they now stop to buy a Wurst or play on their smartphones. Architects and bombers have swept away many of the buildings from that time, and 1848 – a ‘failed’ revolution – doesn’t quite hold the same significance as 1871, when the German lands became a united empire. It can be difficult to associate the Berlin of today with the Berlin that I come across in the newspapers of the 1840s. The city changes constantly as it is: it’s hard to go a single day here without overhearing a discussion about the increasing gentrification of formerly run-down neighbourhoods, or arguments over the latest building schemes in the centre (the Humboldtforum, currently being built on the site of the East German Palace of the Republic, is not exactly beloved by Berlin residents I’ve talked to). But all hope is not lost. 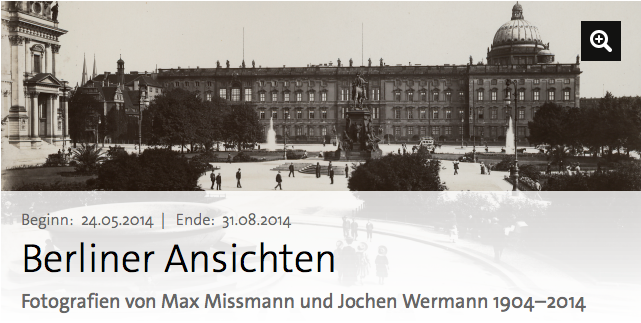 I went to an exhibition last weekend called Berliner Ansichten (views of Berlin), where early twentieth-century photographs of the city were juxtaposed with photographs taken on the same spot earlier this year. They more than anything else helped me to make sense of how Berlin has changed. One photograph in particular caught my eye: a railway bridge over the canal at Gleisdreieck captured in 1905. The caption observed that this railway bridge was part of the Anhalter Eisenbahn, the railway that opened in 1841. I realised that I had actually read newspaper articles from 1841 about the opening of the railway earlier in my stay here, and suddenly I felt elated – I had made a connection between an abstract text and the tangible thing it had described. The obstacles of the twentieth century had momentarily been lifted, and I could look back and see 1840s Berlin, almost as if I had walked through it that morning. My research into newspapers has really helped me to get a feel for nineteenth-century history. Reading texts written long ago can bring the past back to life, but it was especially gratifying to be reminded that the history I study is not limited to articles and advertisements. There is a whole other city out there, if you know where to look for it. This entry was posted in Ellie Roberts and tagged Academia, berlin, Der Spiegel, Germany, History, March Revolution 1848, museums, Newspaper, PhD, postgrad research, research. Bookmark the permalink.